The Ortlieb Bike-Packer & Sport-Packer Plus Panniers are truly the best bicycle touring panniers in the world. In this review, I’ll explain why these expensive, German-made bike bags are so popular among commuters and bicycle travelers alike and I’ll give you a number of reasons as to why Ortlieb bike panniers are the only panniers to own if you are interested in having the very best bike bags for on-road use. What Is A Bicycle Pannier? Before we can even begin to discuss the intricacies of the Ortlieb Bike-Packer and Sport-Packer Plus panniers, it is important that you first understand what a “pannier” is. A pannier is a bag that attaches to your bicycle (via your bicycle’s front or rear rack) and is used to store and transport your personal belongings with you on your bike as your ride. Panniers are usually sold in sets of two (one for the left side of your bike and one for the right) although those wishing to conduct a self-supported bicycle tour may purchase two sets of panniers for their bicycle (one pair to be used on the bicycle’s rear rack, and the other to be used on the front rack). The main benefit to using a set of panniers for bicycle touring (or commuting) is that the weight of your gear (food, clothing, bike tools, etc) is placed onto the frame of your bicycle and not onto your back, neck, shoulders or body (which tends to cause pain, redness, sweating and discomfort). 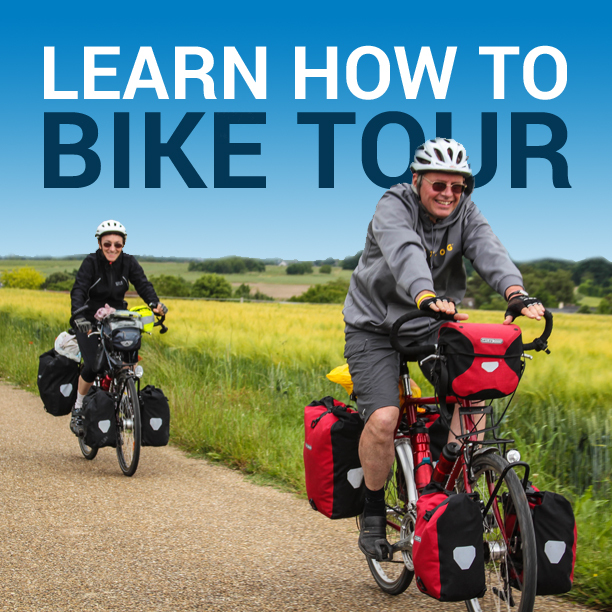 Other major benefits include a low center of gravity (which makes controlling your bicycle easier) and a compact means of transporting your gear (in comparison to a trailer, for instance, which can double the length of your bicycle). In essence, if you have something you want to carry with you on your bicycle as you ride, one or two sets of panniers is a great way to do it! While there are other methods of carrying your personal belongings on your bike (such as with a trailer, backpack, or basket), panniers are the most popular means of transporting your things on a bicycle tour – whether that be a short bicycle tour near your home or a long-distance bicycle touring adventure on the other side of the world. In this review we will be looking at two different sets of bike panniers from a Germany company called Ortlieb. The first set of panniers is called the Bike-Packer Plus. This is the larger of the two panniers discussed in this review and it is meant to be used on the rear rack of your bicycle. If you choose to, you can add a pair of small outer pockets to these panniers. These small pockets on these Ortlieb bike panniers will add approximately 220 cubic inches (3.6 Liters) per pair to the volume mentioned above, thereby increasing the total pannier capacity to 3,271 cubic inches/pair (53.6 Liters/pair). The Ortlieb Sport-Packer Plus panniers, on the other-hand, are much smaller and while they are generally meant to be used on the front of a fully-loaded touring bicycle, they can also be used as a small set of panniers carried on your bicycle’s rear rack. Once again, you have the option (although I wouldn’t recommend it) of adding a pair of small outer pockets to your Sport-Packer panniers, thereby adding an extra 220 cubic inches (3.6 Liters) per pair, and increasing your total pannier capacity to 2,051 cubic inches (33.6 Liters/pair). Are Ortlieb Bike Panniers Really As Good As They Say They Are? The following is a detailed breakdown of each of the characteristics found on the Ortlieb Bike-Packer and Sport-Packer panniers. Read through this list and then continue reading for more information on what I believe to be the best and worst design characteristics of these incredible commuter and cycle touring bags. Constructed of durable Cordura® fabric – Some panniers fall apart after just a few months of use. But I’ve had my Ortlieb panniers for more than five years and have used them for more than three years of demanding round-the-world bicycle touring… and they still look as though they were brand new. If you don’t totally abuse them, they will last a lifetime! The quality is top notch. Top-loading lid – The lid design found on both the Bike-Packer and Sport-Packer Plus panniers allows you to quickly and easily access the gear inside your bags (something you will do dozens, maybe even hundreds or thousands of times over the length of your tour). Unlike other panniers that are designed with a waterproof roll-top (which is difficult to get in and out of), the top-loading lids on the Bike-Packer and Sport-Packer Plus panniers makes accessing your belongings that much easier. Internal drawstring closure – At the top of each pannier are two separate drawstrings which allow you to quickly and easily close off the top of your panniers in order to protect your valuables against dust, humidity and snow. I personally never use the lower drawstring (and therefore think it could be eliminated entirely), but am sure that some cyclists do. Ideal size for short or long bike tours – The Bike-Packer Plus panniers (which are bigger than the Sport-Packers and are meant to be used on the rear rack of your bicycle) are the perfect size for light touring, meaning that if you were concerned with packing light, you could use only this one pair of panniers and still fit everything you would need for a long-distance self-supported bicycle tour into them. However, they aren’t so big that they make your bicycle difficult to manage. The Sport-Packer Plus panniers (which are smaller and are meant to be used on the front rack of your bicycle) are again ideally sized. They are big enough to store a significant amount of gear, yet not so big that they make steering your bicycle difficult or dangerous. I’ve used the Bike/Sport-Packer Plus panniers on both fully-loaded touring bicycles and on folding bicycles, and their size is ideal regardless of what kind of bike you are riding. Bag shape eliminates heel contact during pedal stroke – This is an obvious design characteristic found on almost all bicycle touring panniers. It’s easier to identify in some brands of panniers than in others, but this is a basic design trait that makes the top of the rear (Bike-Packer) pannier wider than its bottom. This allows the heel of your foot to slide past the pannier without hitting it as you pedal. Without this simple characteristic, the heel of your shoes might hit the front part of your rear pannier every time you made a revolution of the pedals, causing damage to both your shoes and your panniers, while at the same time slowly driving you insane. Inner pocket and additional internal zippered mesh pocket – Inside each pannier is a large, thin pocket, which can be used to store flat objects, such as maps… as well as a small, envelope-sized mesh pocket, which can be used to store small objects that might otherwise get lost in the bottom of your bags. I hardly ever use these two inner pockets and wonder if other cyclists use them either. Personally, I think they could be eliminated, or at the very least, reduced in size. However, they are there for those individuals who wish to use them. Waterproof external pocket or mesh breathable pocket – There are two different designs seen on new and older versions of the Bike-Packer and Sport-Packer Plus panniers. The older design (which is what I have) comes with a lightweight mesh pocket on the exterior side of the panniers. This mesh pocket can be used to store small items or used to dry wet articles of clothing as you ride. The newer version of the Biker-Packer and Sport-Packer panniers (released in 2009) comes with a heavier, waterproof pocket, which be me removed from the pannier if desired and is useful for storing smaller items that might otherwise giggle lose inside your bags. Be sure to pay attention to which panniers you are getting when you make your order. Both the mesh and waterproof pocketed panniers are still available, so know what you are getting before you have your panniers delivered. QL2 rotating mounting system – The mounting system on Ortlieb panniers is one of the best in the industry. The mount features two adjustable hooks at the top and a single adjustable plastic hook at the bottom, which can be adjusted to fit practically any front or rear bicycle rack ever made. The panniers attach to the racks without requiring any tools and can be placed on the bike or taken off the front or rear racks with just one hand after a little practice. The Ortlieb pannier hooks are mounted on rails, and can slide from side to side on the back of the panniers, so you can choose the perfect place to put the hooks depending on the type of racks you are using and the ideal position of the panniers on your bike. If you need a little extra heel clearance for a large shoe size, you can simply slide the panniers back on the rails. And the hook mechanisms are operated by the carrying handle. When you want to take the panniers off the bike, you simply lift the panniers by the handle. They come off so easily that you will wonder how they stayed on the bike in the first place! But rest assured, when they are mounted on the rack, they are locked in place around the top of your rack and are quite secure. Handle on top for easy carrying – At the top of each bag is a fabric handle that makes lifting the pannier on and off the bike a total breeze. This handle can also be used to carry the panniers off the bike (such as into a supermarket, hotel or nearby vehicle). Once your panniers are on your bicycle, the handle at the top of each pannier functions as the release for the locking two locking mounts. To remove the pannier from your rack, simply lift the pannier by its carrying handle and the locks are disengaged. Alternate attachment hooks included to accommodate various rack diameters – The hooks at the top of the mounts on the back of each pannier come designed to fit 8mm, 10mm, and 16mm racks, so no matter what size racks you are using on the front or rear of your bicycle, you can rest assured that your Ortlieb panniers will fit – no matter what! Reflective accents for improved visibility – Both the Sport-Packer and Bike-Packer Plus panniers feature two lateral 3M Scotchlite™ reflector patches, thereby enhancing your bicycle’s visibility in low light. These high-visibility reflectors make it easier for cars, pedestrians and other cyclists to see you on the road. Compression straps – Two large straps at the top of each pannier make it easier to transport less gear when needed and reduce the overall size and wind-drag of your bags. In my opinion, the straps are less useful at decreasing the size of your panniers, but are more useful when attaching additional items (such as a rain jacket, water bottle, etc) to the tops of your panniers when needed. Removable shoulder strap – Each Ortlieb pannier also comes with an adjustable shoulder strap, which allows you to carry your panniers around on foot once you step off the bike. This is yet another feature of these panniers that I have never used, but am sure that other cyclists actually do – depending on the type of bicycle tour being conducted and, of course, personal preference. All sets include both left and right bags – It is important to note that when you purchase a set of Ortlieb panniers, you are not just purchasing a single bag, but are instead purchasing a left and right combination. This means that the price you are seeing for your Ortlieb panniers is not just for one pannier, but for two! Panniers are sold in sets of two because it is important to keep the weight on the sides of your bicycle as equal as possible when you ride, as using unequal loads can cause damage to your bicycle’s racks and/or frame. Symmetrical shape – Another genius design characteristic of these panniers is that each bag is symmetrical, allowing the panniers to be used on either the left or right side of your bicycle. Available in multiple colors – While the color choices for all of Ortlieb’s products are severely limited, the Bike-Packer and Sport-Packer Plus panniers are available in a number of different colors. The most popular color combinations are Red/Black, Graphite/Black, Black/Black, Yellow/Black, and White/Black (although a few other color options do exist and collector’s editions are available in limited quantities). Made in Germany – Finally, all of Ortlieb’s products are made in Germany. This might not be a characteristic of the panniers themselves, but it is a signifier of high quality. Ortlieb has received a number of quality awards for their products, which goes to show that when you purchase a set of Ortlieb panniers, you really are getting the very best. Mesh or waterproof external pockets – As I mentioned previously, you can choose to add an optional mesh or waterproof pocket to the outside of your panniers. These small pockets increase your overall carrying volume and allow you to store small objects that might otherwise get lost in the large bucket-style pannier. Water bottle carriers – If you are traveling through an area where extra water must be carried, you might consider attaching a set of water bottle carries to your Ortlieb panniers. Internal laptop case – The modern bicycle traveler might benefit from Ortlieb’s padded laptop case, designed exclusively for use with the company’s pannier products. I’m not sure if the Ortlieb laptop case is any better than some of the other laptop cases on the market, but if you want a matching set of Ortlieb gear, here is your opportunity. Ortlieb Bike-Packer Plus day pack – If you are looking for a way to carry your belongings not only on the bike, but off the bike as well (which is a common thing to do when bicycle touring), you might consider using the harness system designed to convert one of your rear Bike-Packer Plus panniers into a comfortable to carry backpack. Anti-theft device – This simple cable lock security system can be integrated into the upper mounting rail of your panniers to add an additional layer of security to your bike when you leave it locked on the street for short or long periods of time. Top-notch quality and design – The quality of the Ortlieb Bike-Packer and Sport-Packer panniers is truly top notch. The panniers will (with proper care) last a lifetime. They are functional, well-designed, and perfectly sized for both short and long-distance bicycle tours (and even for local commuting). The lid-top design is easy to use and makes life on the road so much easier, as accessing your belongings every day is a breeze. These panniers have been designed by experts who have clearly done their homework and set out to create the best bicycle touring pannier. Frankly, I think they’ve done just that. Stylish, non-plastic appearance – I like the Bike-Packer and Sport-Packer Plus panniers because their natural Cordura fabric exteriors makes them look stylish and approachable, unlike some or Ortlieb’s other panniers (and panniers made by other companies), which have a cold, plastic or sterile medical looking exterior to them. You don’t have to think about them – The ease of use with these panniers is really to be commended. While other panniers require multiple hands to load and unload or lock into place, Ortlieb panniers can truly be loaded onto the bike or removed entirely with just once hand. This makes your daily life as a bicycle traveler that much easier… and is another great reason that Ortlieb panniers stand at the top of the pack. Not entirely waterproof – It should be noted that the Bike-Packer and Sport-Packer Plus panniers are not entirely waterproof. While they are waterproof from rain, hail and snow that falls from above, they are not 100% waterproof in the context of dropping them into a large body of water. Because the Bike/Sport-Packer Plus panniers feature a lid-top design, rather than a roll-top, the panniers are susceptible to water coming in through the top if they were submerged underwater (or maybe even blasted by a high-powered hose). If you are planning to travel with your bike on a boat, river or sea, or if you have concerns about your belongings getting wet in any way, the more waterproof roll-top Classic panniers that Ortlieb makes are probably going to be better for you to use. Not ideal for off-road use – While the design of Ortlieb’s mounting system should be commended (it truly is one of the best pannier mounts in the world), the bottom latch, which is used to hold the rear portion of your panniers in place as you ride, has a tendency to come loose (and sometimes fall off completely) in rougher terrain. This is typically no problem in a road touring environment. You don’t really even need that bottom latch in most instances. However, in an off-road environment (or on especially bumpy roads), the fact that that bottom latch comes loose is less than ideal. This is why I recommend the Ortlieb Bike-Packer and Sport-Packer Plus panniers for road touring only. If you are planning an off-road bicycle touring adventure, I think the mounting system on Arkel and Lone Peak panniers is much better. Some features/weight could be eliminated – Finally, there are a few small things that I would personally eliminate from the panniers if I were in charge. I would get rid of (or drastically reduce the size of) the panniers’ inner pockets and would consider getting rid of the exterior pockets as well. I also think that the size of the bags’ compression straps could be reduced (in order to eliminate weight). Would I Recommend The Ortlieb Bike-Packer & Sport-Packer Plus Panniers? Overall, the Ortlieb Bike-Packer and Sport-Packer Plus panniers are truly incredible bicycle touring bags. Well-designed, perfectly sized, colorful, lightweight, waterproof and stylish. I would wholeheartedly recommend these panniers to anyone who is serious about their bicycle touring exploits. If you want the absolute Top-of-the-Line panniers made anywhere in the world and don’t mind paying a little extra for them, then Ortlieb is the way to go! So, if you’ve been searching for a high-quality pannier set, look no further. The Ortlieb Bike-Packer and Sport-Packer Plus are truly as good as it gets! 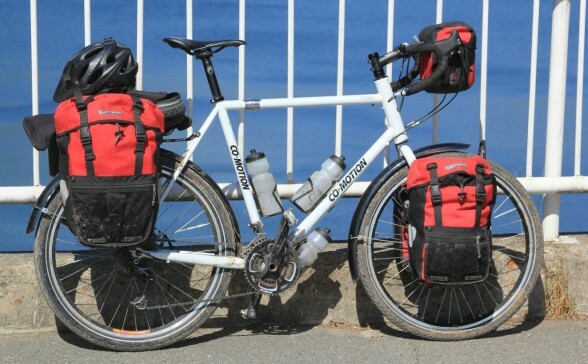 Below is a large collections of photos of the Ortlieb Bike-Packer and Sport-Packer Plus panniers being used on two of my touring bicycles in my travels around the world. The handlebar bag you see in the photos is the matching Ortlieb Ultimate 5 Plus handlebar bag. This entry was posted in Bicycle Touring Pro Articles, Featured Articles, Panniers, Product & Service Reviews, Products and tagged bicycle pannier, bike packer plus, bike panniers, ortlieb, ortlieb bags, ortlieb bike packer plus, ortlieb bike packer plus review, ortlieb pannier review, ortlieb panniers, ortlieb sport packer plus, ortlieb sport packer plus review, sport packer plus, waterproof panniers. I use Ortlieb’s along with Tubus racks for my daily commuter. I find that pretty quickly the panniers wear the paint off the racks and leave metal exposed. Do you find that too? I love my Ortliebs – started out with just the rear set of Bike Packer Plus (Yellow) with the enclosed outer pocket. I would change the size of the inner pocket as it was very useful for my touring documents and other small items – not used often but wanting to have easy access to them. Last year I purchased the Sport-Packer Plus for the front – had to buy a special rack because of the front suspension on my bike but it worked perfectly. They sit a little higher than yours but made a huge difference in bike handling to even out the load between front/back. I’ve worn out a handlebar bag by another company and looking to buy the Ortlieb this year – just not sure which one. When I see the mounting method for it, I’m a bit concerned. I’ll send you a photo and see if it is the same as your mount. Thanks for the great review – I use the shoulder strap and keep it attached to the bag all the time – I’ve got an easy way to secure it within the compression straps so it is never dangling but helpful when I have to carry my panniers some distance away from my bike or through the airport. I spent months researching before I bought – and I’m really glad I spent more money on the Ortlieb – worth every extra dollar. Wonderful review! I have been using Ortlieb bags for the last 8 years. They are the best. You mention that you do not recommend the external pockets on the front panniers. These can be attached to both the front and rear and I use them both. They are very handy for small items that are not being used very often, like tools, lights, etc. Also useful for small items that you might use often like gloves, shoe covers, vest, etc. I just like having more pockets for organizing things. You do have to be a little careful when using the front pockets depending on how your bags hang on your rack. You do not want them to ever touch your front wheel for obvious reasons. Is this the reason that you do not recommend them? Thanks for the review. I really enjoy your site. 2. waterproof cordura material with an internal frame (all double zips have a built in rain covers) but like the Ortliebs wouldn’t do well if submerged entirely. Th downside is that Cannondale no longer makes these panniers which is sad because they are great! However, they are still available on the open market. My front panniers are made by Taiga. They feature an external pocket and internal stiffened backing. Unfortunately the mounting system is not very convenient so I modified them to match the Cannondales. Now easy on easy off just like the Cannondales. They also are waterproof Cordura with and internal drawstring, external cover & 4 external straps to cinch things in. I live in Thailand and have toured throughout Southeast Asia on both good and bad roads with these panniers and have never had a problem despite the heavy rain encountered throughout the area. I love Ortliebs also for their durability and water resistance. Separate rain covers is so 1960s! I still am impressed with my friend’s rolltops, however, as they open up more quickly and much wider than the cinchcord Bike Packer/Sport Packer models. but it’s all good with Ortlieb. Great article, Darren. You da man! Yeah, I been thinking Ortlieb. The panniers I have now just won’t do. Glad to know that you have a Bike Friday too. I appreciate the photos of it loaded and ready to roll. I have front and rear Blackburn MTN racks on my BF. Welded aluminum; what do you think? What about the handle bar bag? Would you recommend it? and where can you find it? Thank you Darren, most enlightening…. Thanks for the good review and I really enjoyed your pictures. Now I feel like loading up and heading on some cool trips. Seems like you have done some interesting rides – where are these photos from? Steve, these photos are from all over the world – Europe, Africa and North America. There are probably 20 different countries shown in these various photos. Good article , I have the same but in black , I find the front bags do not hold on the QL2 mounting , think I will use an elastic strap and I find it annoying that the rear bags do not have a pull down strap like the front bags , also agree the internal zip bag is bulky and not used except for sticking my folding fry pan and plate -bowl down, never used the carry straps , also find the snow hoods tight when full , having said that would not change them for anything else . Best wishes ! do you have exp with Vaude panniers? if yes what do you think? Hi Darren, just like to say great work with your whole site and youtube videos and web seminars. I am planning my around the world trip with my girlfriend next year and i am a little stuck on which panniers to get. I am looking at ortlieb bike packer plus and sport packer plus in the new blue colour that you have or the arkel xm 45 and 28’s in yellow but i have a question if you could answer it please. 1. Do the ortliebs suffer from condensation build up? as have herd reports of waterproof panniers doing so especially in hot weather but the arkels are cordura so will breath better and i store all my gear in exped dry bags to keep dry and for organisation as i hike a lot so have done this for years so waterproof not a major issue but just want the most convenient less hassle option for on the road. 2. You say in your review that for off road they are not so good and we will be doing a little as and when it is available but could i fix the bottom bracket to desired position and use loctite to fix it in position so it would then not come loose? or do you think that would not work?. 3. You tested the arkel xm panniers, did you have much experience with them in bad weather? and if so did they hold up quite well as to not getting soaked inside?. Sorry for all the questions as you must be busy but you just seem like the man to know. Sounds like you and your girlfriend have got some incredible times ahead of you. 2. Ortliebs are fine for most dirt road conditions. They just aren’t great because that bottom hook does come undone. But yes, this depends on how bumpy the road is and how well you position that hook on your bicycle/rack. Even if the bottom hook does come updone though, it’s not really a big deal because the pannier is still locked in place from the top (which is the most important). 3. The Arkel panniers need an extra rain cover in wet-weather conditions. I don’t like to have to stop and put that cover on ever time it rains. Plus it’s an extra thing to carry. Which is why I prefer the Ortlieb panniers. 4. I like the Ortlieb’s better. I think they will survive a round-the-world trip better. Which is why you see so many bicycle tourists using that particular brand over all the others. Hi Darren, thanks so much for taking your time to reply it is much appreciated. Yeah i cant wait for one adventure to end and another to begin haha, “never stop exploring!” is the best way to live. I am planning a cross-country bike tour with a Fuji touring bike. I am thinking of buying these panniers. I am having a hard time finding if these are compatible with the rear rack that comes on the fuji touring. Alos, what front rack I should buy for these pannier? It seems the tubus tara is a good option. I have full pannier sets of both Ortlieb Roller Classics and Vaude Aqua Plus. I prefer the Vaudes as they are so much easier to use every day e.g. clipping on and off and so more robust. Downside is that they are a little heavier but once your using them everyday this disappears. They have hard backs to attach to a rack so no flex or bending of the hook mount bar which could happen when the pannier is stuffed full and heavy. Hey Darren the info about the panniers is great. The greatest feature that you mention is that you can actually transform the pannier into a normal hiking back pack. How easy is it to transfrom the panniers into a back pack?